Allergy Advice: Contains Wheat, Crab, Shrimp. Manufactured in a facility that also processes egg, milk, wheat, soybean, shrimp, peanut, crab. 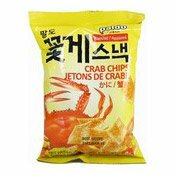 Ingredients: Wheat Flour, Corn Starch, Wheat Starch, Palm Oil, Crab Seasoning (Crab Extract, Maltodextrin, Crab Flavour), Crab Extract, Dried Shrimp, Sugar, Kelp Powder, Salt, Sweetener (E950). Simply enter your details below and we will send you an e-mail when “Crab Flavoured Chips (蟹味小食)” is back in stock!